"E∗TRADE is a strong advocate of investor education, understanding a knowledgeable investor is a successful investor. The Market Guys have been a key contributor to our worldwide educational efforts  delivering hundreds of seminars to our customers around the world. This book encapsulates their years of experience with traders and investors, and is a must–read for anyone serious about trading. 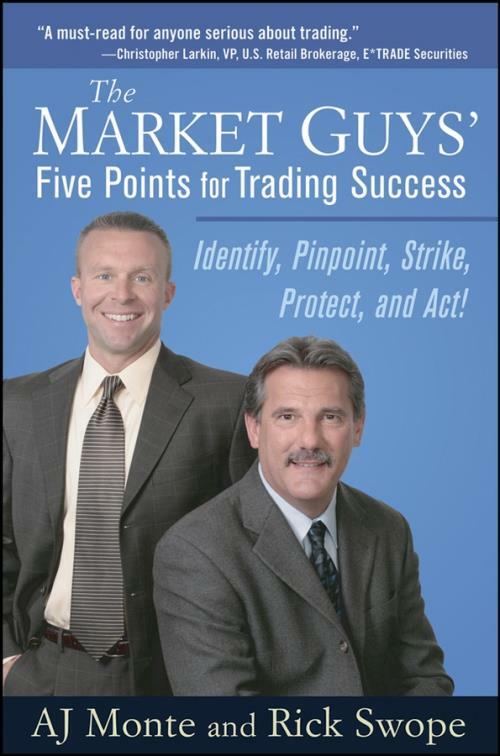 The Market Guys′ Five Points for Trading Success provides an easy–to–understand and disciplined approach to trading through risk management. I highly recommend it." "The stock market is full of risk and uncertainty, but can bring great rewards to those who plan and execute properly. Rick and AJ give you the navigational tools to profit in the market through this book. Easy to read and understand, this book will help the novice and expert alike reach their financial goals. I recommend The Market Guys to help you along your journey!" "The Market Guys′ Five Points is much more than five points. Creating a plan, dealing with emotions, trading psychology, and technical analysis are just some of the topics explained." "Most people think trading markets is easy, but the process is fraught with pitfalls, snares, and delusions. This book is written by two savvy veteran traders. Applying the wisdom contained here will not guarantee success, but it will very definitely put the odds strongly in your favor." "This is a wonderful introduction to terminology and a fresh approach to the stock market. It gives the reader a language and way of thinking that is new, providing a great foundation for further research. These authors are to be commended for an excellent book on the stock market and how it works." "The Market Guys have created the perfect recipe for financial success." Chapter 1. Blueprint for Success. Trading is No Longer a Team Sport. Beware the Siren Song of Gurus. Know When to Fold ′Em. Shucking Right Down to the Cob. Chapter 2. Are You Out of Your Mind? How to Work with Your Emotions. Technical Analysis or Tea Leaves? Point 1. Follow the Money Trail. Chapter 3. It Pays to Be Trendy. Putting Your Money with the Money. The Crowd May be Wrong, but they′re Still the Crowd. Chapter 4. The Trader′s Toolbox. How to Pick a Hammer when the Market Gives You a Nail. Don′t Plow a Field with Your Mercedes. Chapter 5. Ten Common Mistakes Made by Traders (And How to Avoid them!). Mistake #1: Marrying Your Stock and Finding Trades that Aren′t There. Mistake #2: Failing to Accept a Loss. Mistake #3: Doubling Down on a Losing Position. Mistake #4: Lack of Training and Preparation. Mistake #5: Trading with Scared Money. Mistake #6: Buying Cheap Options. Mistake #7: Overcomplicating the Analysis. Mistake #9: Using Software Crutches. Mistake #10: Trading Without a Plan. Point 2. Establish A Clear Support Level. Chapter 6. The Role Reversal. Your Opinion Won′t Move a Market. Dollar Cost Averaging Vs. Cost Averaging Down. A Good Plan Gone Bad. Pursuit of the Breakeven Point. The Building Blocks of a Role Reversal Pattern. The Psychology Behind the Move. The Role Reversal from the Short Side. More Traders Drawing the Lines. Chapter 7. Seventh inning Stretch. Chapter 8. E Pluribus Unum. Out of Many Stocks, One. It May be a Small World but it′s a Big Market. "When You Come to a Fork in the Road, Take it". Point 3. Wait for the Pivot Point. Chapter 9. Going with the Flow. Don′t Jump in too Early. Jiu Jitsui Trading – Knowing When to Tap. Use the Market without Guilt. Chapter 10. Essential Options, Part 1. Call Options, or Pizza Coupons. Chapter 11. Essential Options, Part 2. On Expiration Day, the Option must be Worth at Least Intrinsic Value. Closing Your Option Position at Expiration. Closing Your Option Prior to Expiration Friday. Point 4. The 1% Rule. Learning to Lose Money the Right Way. Is There Really Such Thing as a Safe Investment? I′d Like to Buy a Vowel. Everyone Should Be Above Average. Five Principles of Risk Management. Managing Risk in a Probabilistic World. Chapter 13. Trading Hall of Shame. Traders You Don′t Want to Imitate. Barry The Bottom Fisher: Always Buys The Low (Until It Makes A New Low). Break–Even Betty: Forget Profits, Breaking Even Is Her Goal. Seminar Sal: He′s Everywhere, but is he making money? The Frozen Chosen: Holding Back Because Of Fear. Larry The Lemming: Follows The Crowd, Not The Money. Norman Is An Island: Trades In Seclusion, To His Theme Song, "All By Myself". Urgent Carl: He′s Trading, But He′s Not Weaned. Oz and Trish: The Couple that Vows to Ignore any Losing Position. It′s Funny until it Hurts. Chapter 14. Going to the Dance. 3. Trading and Investing Products. Chapter 15. The Trade and Beyond. Product: The Market Guys' Five Points for Trading Success. Identify, Pinpoint, Strike, Protect and Act!